It’s not often I get overly excited about a book and want to tell everyone how much I enjoyed it. Normally that only happens with Bill Bryson books. Sure, I write about a lot of books here, but not all of them make me want to do cartwheels. I find myself content at the end of most of the books I write about here, no longer bothering to mention those I dislike, and smile as I place them on the shelf next to the others I’ve finished. But, when I cracked the binding of Peter Matthiessen’s The Snow Leopard, I knew I had another winner. I zipped through The Snow Leopard in no time, enraptured by every word on each page. I loved his story about a 1973 trip to a the Himalayas to study blue sheep with his friend, biologist George Schaller. Peter was mainly along for the ride, if you will, leaving the studies up to Schaller, since he was more interested in a spiritual journey through the mountains as a Buddhist. Peter Matthiessen writes about their journey as though he’s writing in a journal each night before bed. I found this made the story incredibly easy to relate to, despite the fact that they’re on an incredible trek through the highest mountain range in the world. 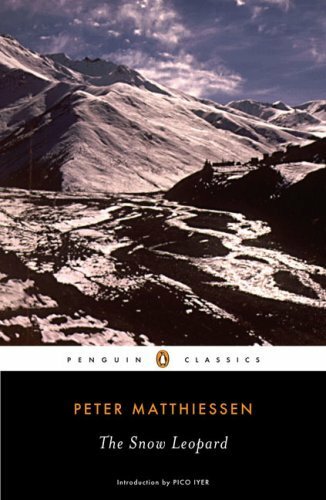 I have no doubt, though, that Matthiessen put a great more deal of effort into writing The Snow Leopard than just a few scribbled notes as he curled up in his tent at night. The language is beautiful, near mesmerizing, and carefully thought out. The Snow Leopard is also an incredibly personal story, as Matthiessen writes about his time away from his children and his guilt for leaving them shortly after his wife, their mother, passed away from cancer. The view into his subconscious that this offered really tied the story together for me, opposed to just another story about how someone went here and did that for one reason or another. Instead, Matthiessen created an intense personal connection with me, as a reader, on his journey while his search for spirituality and the elusive snow leopard turned into a metaphor for so much more than what the back cover’s synopsis would indicate. I cannot recommend Peter Matthiessen’s The Snow Leopard enough; this is flat out one of my favorite travel books. It is easy to connect to and exotic enough to remain intrigued about a distant land and a journey that makes the most seasoned of travelers envious. I suppose that’s why it rated on World Hum’s 100 Most Celebrated Travel Books of All Time list.